Bell peppers are one of my favorite vegetables. They’re crispy, crunchy, juicy, and are sweet-with-heat. It’s no wonder I also love smoked paprika which is made from smoked and ground red peppers. This fast and easy recipe that’s ready in 20 minutes has red peppers, orange peppers, and smoked paprika. If you’re a pepper lover like me, you’ve hit the pepper jackpot. 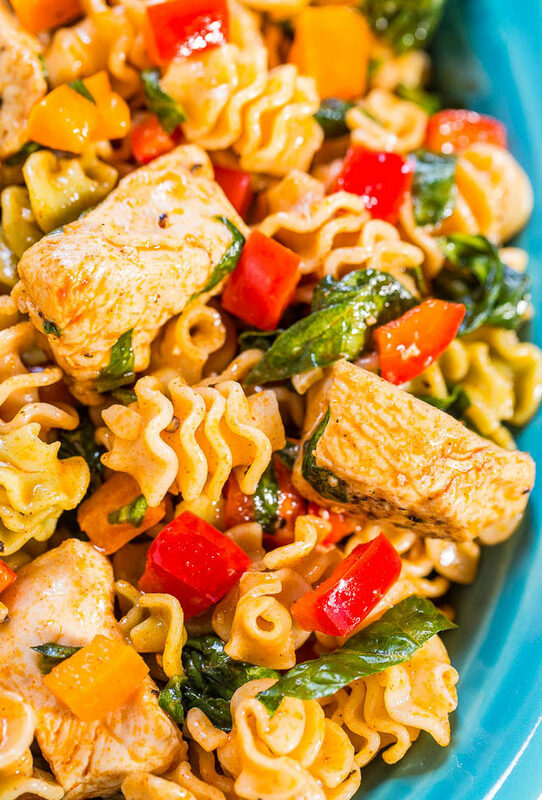 The tangy, sweet, peppery, and smoky sauce the chicken cooks in is poured over and tossed with rotini pasta, spinach, and peppers. I used vegetable rotini to keep things healthier and because I love pasta salads that use rotini. The kid in me says that some shapes just taste better and rotini is that shape. 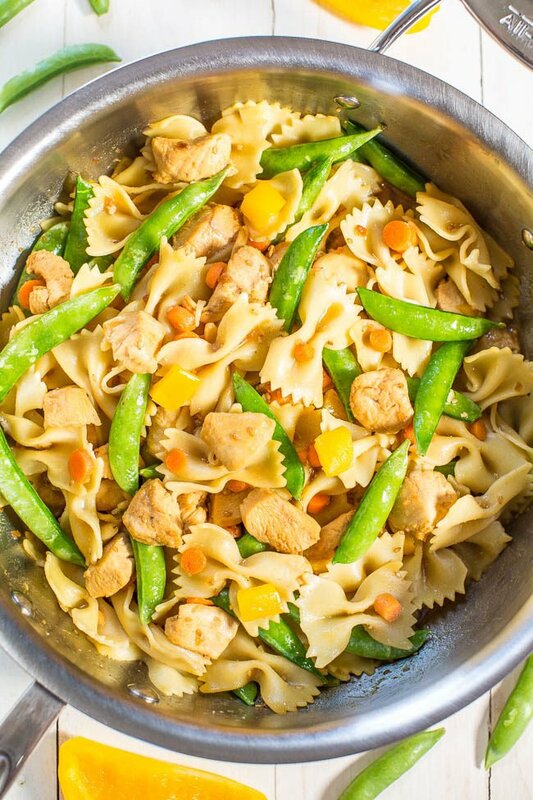 There’s great texture contrast from the soft pasta, moist and juicy chicken, crunchy vegetables, and it’s versatile. You can increase the overall recipe yield and the vegetable quotient by adding carrots, edamame, green onions, sugar snap peas, red cabbage, or other favorite veggies. You can serve it warm or chilled for a cold pasta salad making it great for potlucks, picnics, and parties. 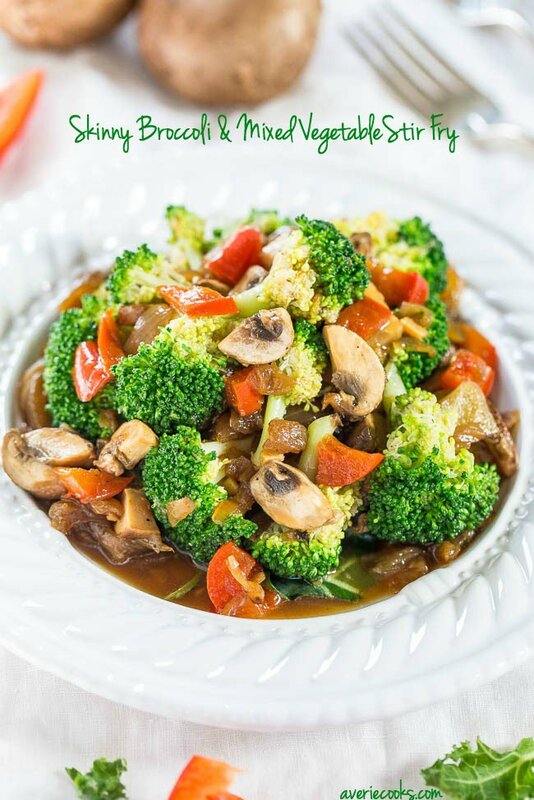 It’s healthy, perfect for busy nights, and makes a big batch which is great for planned leftovers and work or school lunches for the week. This fast and easy recipe that’s ready in 20 minutes has red peppers, orange peppers, and smoked paprika. If you’re a pepper lover, you’ve hit the pepper jackpot. 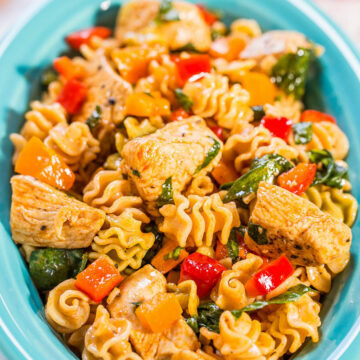 The tangy, sweet, peppery, and smoky sauce the chicken cooks in is poured over and tossed with rotini pasta, spinach, and peppers. 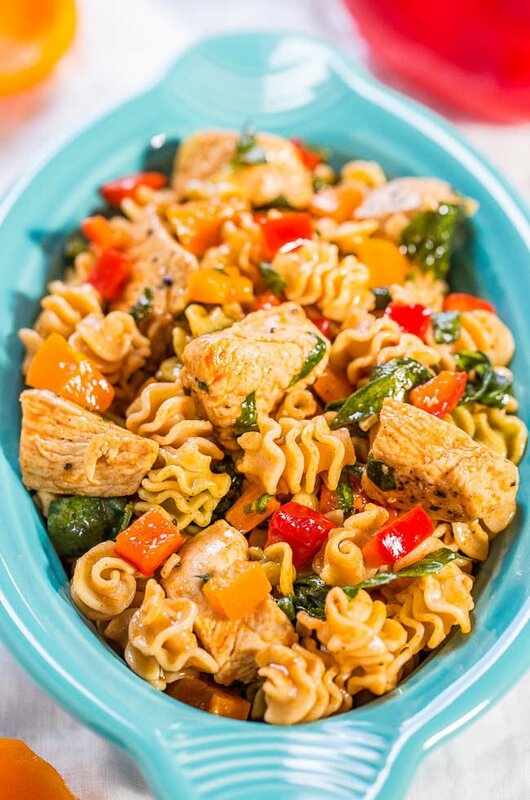 I used vegetable rotini to keep things healthier and there’s great texture contrast from the soft pasta, moist and juicy chicken, crunchy vegetables, and it’s versatile. Serve it warm or chilled and it’s great for potlucks, picnics, and parties. It’s healthy, perfect for busy nights, and work or school lunches. To a medium bowl or large measuring cup, add the honey, vinegar, 2 tablespoons olive oil, lemon juice, brown sugar, smoked paprika, salt, pepper, and stir to combine; set sauce aside. Carefully add the sauce, noting that it may bubble up in the first few seconds. Allow sauce to bubble at a medium-fast boil for about 3 to 4 minutes, or until sauce has reduced some and chicken is cooked through. Stir sauce and flip chicken intermittently throughout. You’ll still have quite a bit of sauce in the pan after 3 to 4 minutes which is good because there’s a lot of pasta and vegetables to coat. Allow chicken to rest in pan off the heat while you chop the spinach and peppers. Add the spinach, peppers, chicken and all the sauce to the bowl of pasta and stir well to combine. Taste and check for seasoning balance, making any necessary adjustments. Dish can be served warm immediately or can be served as a cold pasta salad. Will keep airtight in the fridge for up to 4 days. Serve cold or reheat gently prior to serving if desired. 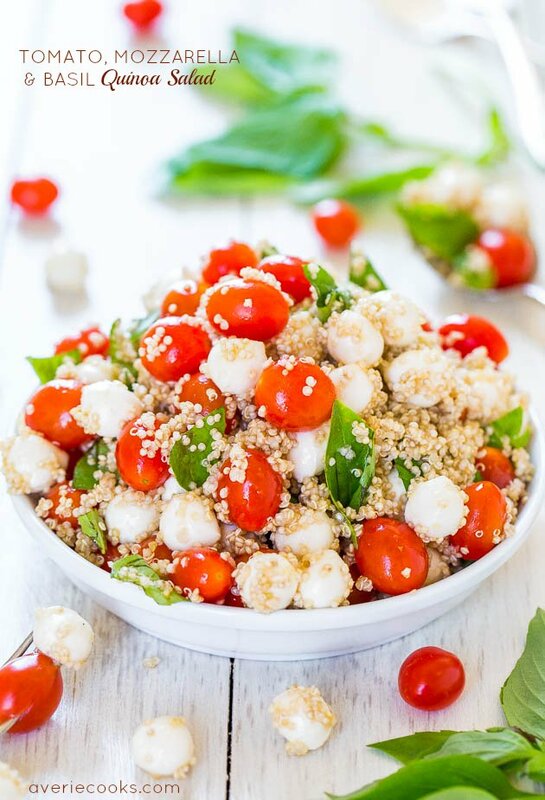 Tomato, Mozzarella, and Basil Quinoa Salad – (GF) – Trying to keep meals healthier and lighter? Make this easy, refreshing & satisfying salad! I’m with you on pepper. Have you ever had pepper jelly? The stuff is crazy addictive for any pepper addict. This looks delicious. I’m fond of rotini, too. It holds on to all the good stuff! And the chicken looks super flavorful! Not only have I had hot pepper jelly (I keep TJs in BUSINESS) but I make my own, twice!! Perfect picnic food and pasta salads like this are WAY too easy for me to go crazy on. With that fusili pasta it just absorbs everything and has so much flavor and so easy to dig into! 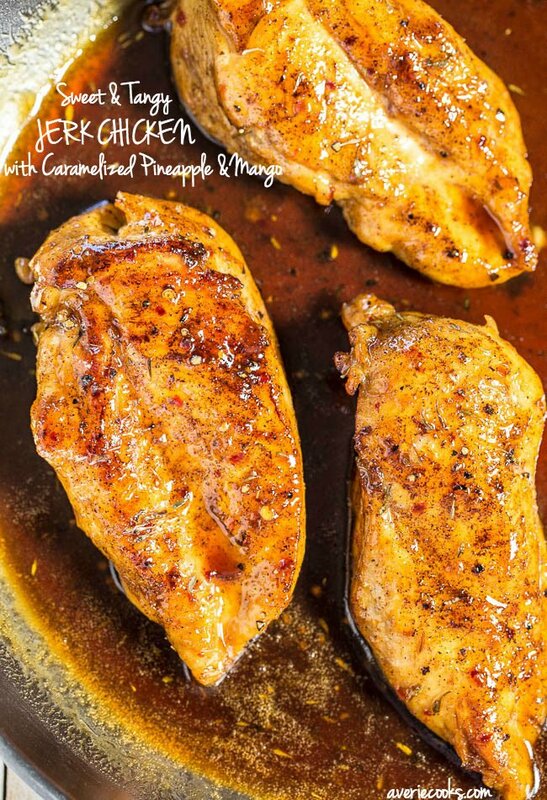 I can’t wait to try this one either– I love the run of chicken and shrimp recipes! I could pull it off today if I had some unthawed chicken so it’s on my radar for later in the week. I think you’ll love this one, Paula! I know you like smoked paprika and all these flavors so LMK how it goes if you try it! YESSSS to smoked paprika! I am pretty sure that I put it in ALL the things! I’ve never tried it in pasta salad though …but, umm, my face needs IT. Pinned! Thanks for pinning and you’re going to love the smoked paprika in pasta! Averie this is making me so hungry! It looks delicious, I’m going to have to try it out! This looks so good!! Peppers = yum, smoked paprika =love, pasta = yes please!! Plus it’s a salad – so I can eat as much of it as I like = thank you!! Pinned! Amen to leftovers and easy lunch-packing! Thanks for pinning and glad you’re as big of a smoked paprika fan as I am! Oh this looks so fabulous….and hooray for a mayo-free dressing that sounds SO flavorful. I will absolutely be trying this summer. Glad you’re enjoying the savory options! Averie this looks so delicious!! Love all the flavors going on here! pasta salad. I like the use of the chicken in the salad too. Definitely a main dish!!! This pasta salad just says summer! 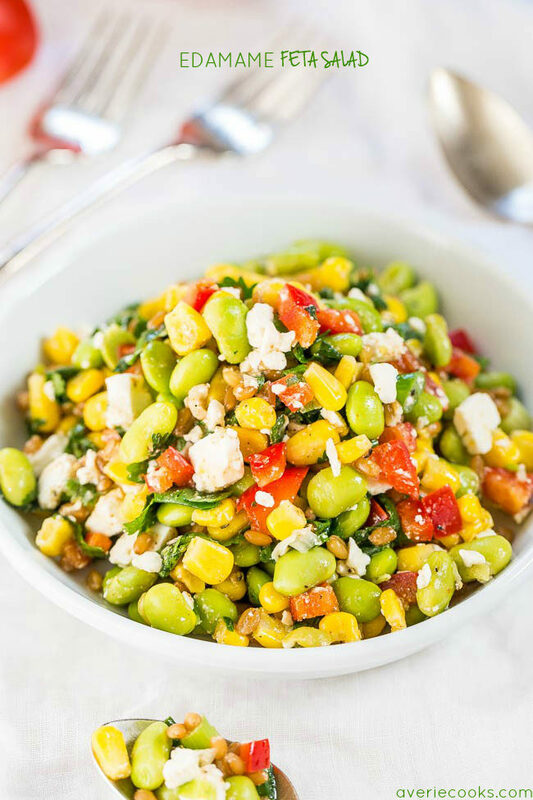 What a perfect side dish for Memorial Day weekend! Totally need this for dinner!! Pinned! Thanks for pinning and have been loving your travel posts and pics the past few days. So pretty!! Looks delicious! I definitely have to give this recipe a try! I am loving all these savory recipes! I ate my way through about 5 bags of those mini peppers in Arizona. I forgot how cheap the produce is there! I ate so many cukes, peppers, and tomatoes…..everything here is at least twice the price. Shameful. Glad you got your peppers and produce in on the cheap! 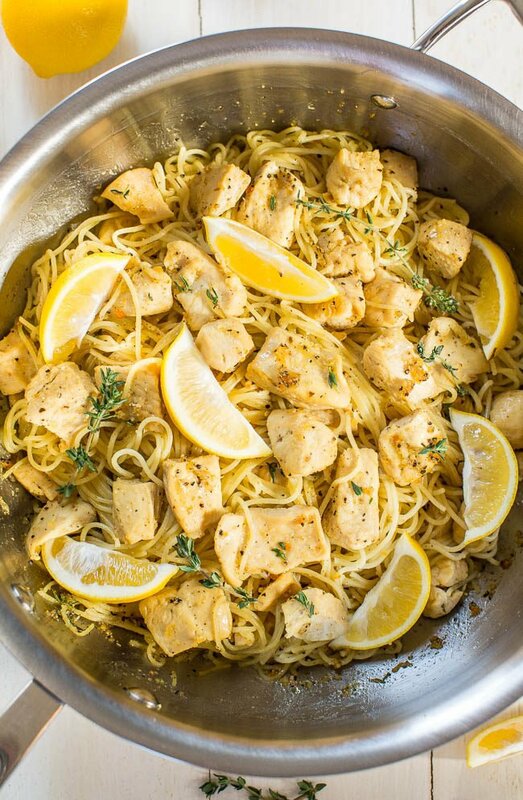 Averie you keep hitting it out of the park with these chicken recipes! This is another winner! Thanks for the compliments and it’s new blog territory for me and it’s been fun to blog about these! Love everything about this dish! Pinned! This made a fantastic lunch–love the sauce with smoked paprika–it really adds depth! My kale is coming in like gangbusters so I used that instead of spinach. We liked it so much I’m thinking about making it again Monday! Finally made this for dinner tonight. Fabulous! My kiddos loved it too. Definitely a winner! Can this be made the night before? Will it get too soggy? Looking for something I can make ahead of party time. I think you’ll be fine making the night before but if you’re really concerned you may want to make a test batch before your event.